Mixfader is a wireless portable hardware crossfader that pairs with your iOS or Android smartphone or tablet running the Mixfader DJ app for scratching on the go. You can also integrate it into your portablism set-up when you use it in conjunction with Mixfader ProLink, which acts as a tiny wireless mixer where your turntable and playback device audio are routed to. It works well and having a solid, physical fader makes scratching on the go more fun. The near-zero latency is impressive, and the makers of Mixfader have put a lot of thought into its solid build and its functionality, and it really shows. Recommended for portablists and those who want to get their scratch on wherever they are. The Mixfader is well-built and feels solid: it gives you the impression that it’s able to withstand loads of heavy use that’s typical of scratch and battle DJs. It comes with a USB cable for charging the device (you get up to 20 hours on a single charge) and it connects via Bluetooth 4.0 which gives you both low energy consumption as well as low latency. You can use the Mixfader two ways: First, you can pair it with your iOS or Android device running the Mixfader DJ app (or another compatible application). Second, and this is for portablists who use portable turntables like the Numark PT01 Scratch, you can pair it with the Mixfader ProLink which is essentially a tiny two-channel mixer that wirelessly connects to the Mixfader crossfader. 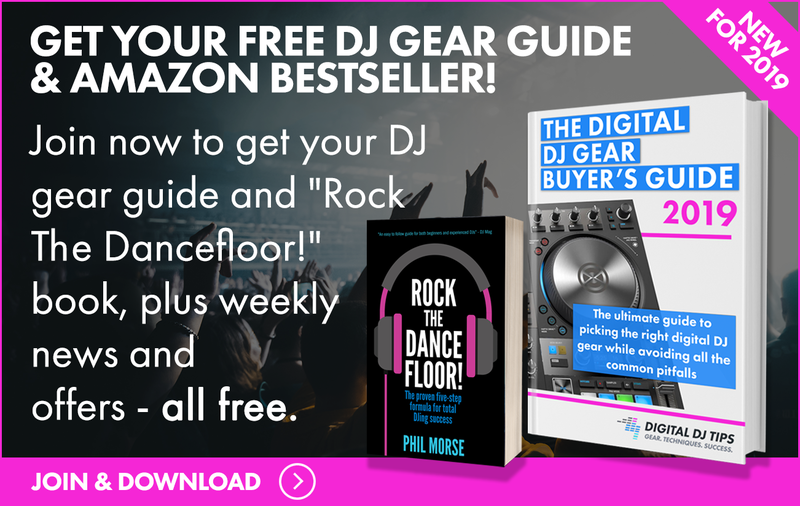 You can then route the output of your portable turntable and your beat playback device like a phone or tablet into it, making for a more robust portablism system that gives you a full-sized physical crossfader to cut with. Mixfader sends Midi data wirelessly, giving you a responsive crossfader that you can use for quick cuts and crossfades, but you’re also able to use it with other apps that accept Midi data such as DAWs via the “Midi protocol” feature in the Mixfader DJ app. The Mixfader DJ app interface looks like half of a vinyl record when used in portrait mode, giving you lots of screen real estate for scratching. You may want to use a single finger instead of multiple because essentially, you’re dragging your hand across your screen instead of moving a record, so you’re creating friction between your fingers and the screen. The physics are different and so is the feel, but you do get used to it after a while. If you’re a portablist and you already own a portable turntable, you’ll probably want to use Mixfader and Mixfader Prolink together to expand the input and output capabilities of your portablism set-up. Thanks to the ProLink you can hook up your turntable, a beat playback device plus a portable speaker like the Minirig for some next-level portablism. 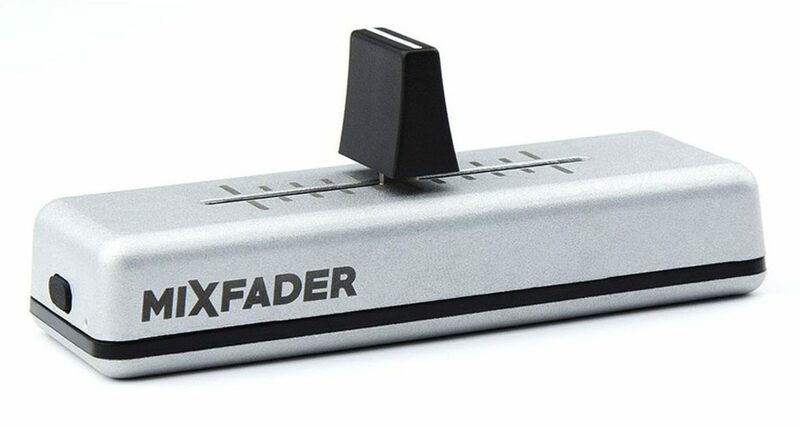 Mixfader is responsive: tiny movements you make with your fader hand are transmitted and read instantly, letting you make those quick, tiny cuts that are essential for fast scratches like crabs. You can adjust the crossfader curve from very standard / smooth to sharp, so you’ve got a lot of configurability in here. You can even set the Mixfader to be a pitch, volume, or FX fader if you like. The only potential downside to scratching with the Mixfader and Mixfader DJ combo is that you’re stuck with the feel of moving your finger across a glass screen. If you’re in a humid environment (or you’ve got sweaty hands) your fingers tend to rub across the screen instead of gliding smoothly, making it harder to do precise scratches especially if you don’t have your smart device properly firmly planted on a surface, in which case the phone or tablet accidentally moves around. That’s just how screens on smartphones and tablets work and it’s not a shortcoming of the Mixfader hardware, but it’s an important consideration for those looking to ditch the portable turntable and use his or her tablet or phone as a total portablism replacement. Overall, the Mixfader itself works well and is fun to use. The near-zero latency is impressive, and the makers of Mixfader have put a lot of thought into its solid build and its functionality, and it really shows. I love how the Mixfader and Mixfader ProLink work together to create a tiny mixer set-up that integrates easily with a portablism set-up. If they come up with an accessory that makes scratching on a glass surface feel more like scratching with vinyl or a jogwheel, though, that would really make this a game changer.